Meet one of our dear members, Cyrena. While she has always been good at balancing work and life and achieving personal goals, this year she knew her main goal was to learn how to swim. 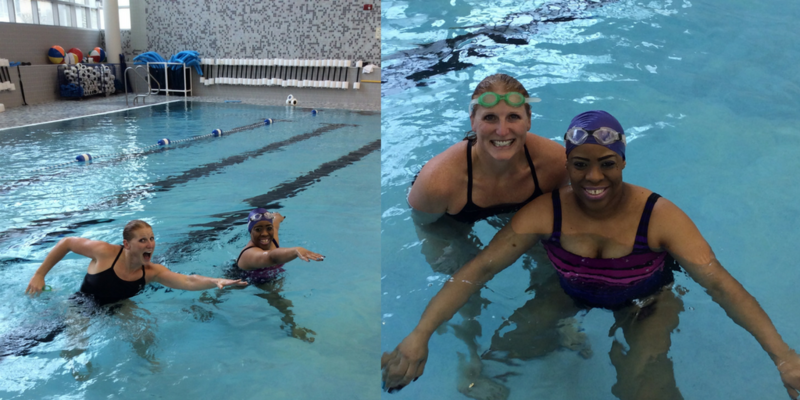 Naturally, Cyrena reached out to group fitness instructors Amy Schultz and Julie Fautsch for private 1:1 swim lessons. As she states, "Between Amy and Julie, my life has changed for the good. I can now finally say I accomplished one of my “lifetime” personal goals: learning to swim." Cyrena and her family have been taking vacations down south to the beaches throughout the years, and she knew it would be so much more enjoyable on those trips if she could dive into the hotel pool or swim at the beach. When she heard about the DAHLC during her Mayo employee orientation in 2006, she found the place she could learn to make this goal a reality. "Procrastination was my ultimate barrier. I was never interested in learning to swim as a child, however; as I became an adult, I became enthused about learning how to swim and realized that I am robbing myself of not only having the skills to be able to swim, but the fact that I could potentially save someone’s life (including my own)." Since becoming a member at the DAHLC, Cyrena had access to 1:1 swim lessons with highly trained, professional, and friendly swim instructors. She recalls that this (the DAHLC) is the greatest gift she could have received from Mayo’s employee benefits! In addition to swim lessons, Cyrena has enjoyed other classes, such as Yoga Basics and Aqua Mixx. "I was very inspired by the enthusiasm of the instructors, coaches, trainers, etc. at the DAHLC. My personal experience with my instructors; Amy S. and Julie F. was phenomenal. To witness the enthusiasm that they had for me and my willingness to succeed in this task and them being actively involved in my progress is simply priceless! Honestly I think they were happier than I was which demonstrates their promotion of Mayo’s Core Value: “The Needs of the Patient Comes First." Their work is exemplary of Mayo’s vision." Cyrena's advice for others is to take wellness and fitness seriously because it's so important. She says, "Forget who's watching...get up and start moving!" Thank you, Cyrena, for being an inspiration of going for your goals no matter what the barriers! You are awesome!